Review of A Prairie Home Companion at Tanglewood July 1, 2000. The 2000 Tanglewood season got underway Saturday with the live broadcast of A Prairie Home Companion with Garrison Keillor and special guests Emanuel Ax, Norumbega Harmony, and the Berkshire Highlanders. It was a pretty good show, mostly – except for the parts that were brilliant. It seems silly to use superlatives to describe a show that had as casual and relaxed a feel to it as this one did, but Keillor used some himself when he introduced Tanglewood and the Berkshires to his vast radio audience, so it’s OK for us to wax laudatory. The selection of special guests was perfect and they all gave great performances. The show’s regulars, The Guy’s All-Star Shoe Band, piano player Richard Dworsky, Tim Russell, Sue Scott, and sound effects master Tom Keith, all turned in their usual excellent performances. Keillor’s monologue, about one of the last of the dying breed of Norwegian bachelor farmers and his struggle to maintain his independence and dignity in the midst of a town full of Pumpkin Heads. Berkshire Highlanders perform on the first broadcast of A Prairie Home Compabion at Tanglewood, July 2, 2000. photo: Dave Read. It was wonderful to see and hear The Berkshire Highlanders in the Shed. 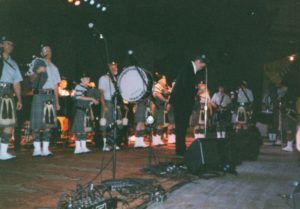 Their Greylock Tartan kilts are perfect representations of the subtly beautiful Berkshire hills, and their repertoire is unusually engaging, as indicated by the Shaker hymn, Simple Gifts they played on stage. In addition to providing the show’s classical music interlude with “Estampes” by Claude Debussy, Emanuel Ax also made his acting debut, starring in an episode of the very funny radio drama, “Guy Noir: Radio Private Eye.” Ax was sharp in both roles. Somehow it seems especially fitting that this Tanglewood season, which celebrates the 100th anniversary of the birth of Aaron Copland, the quintessential American composer, was opened with A Prairie Home Companion, which celebrates everything that’s pretty good about America.